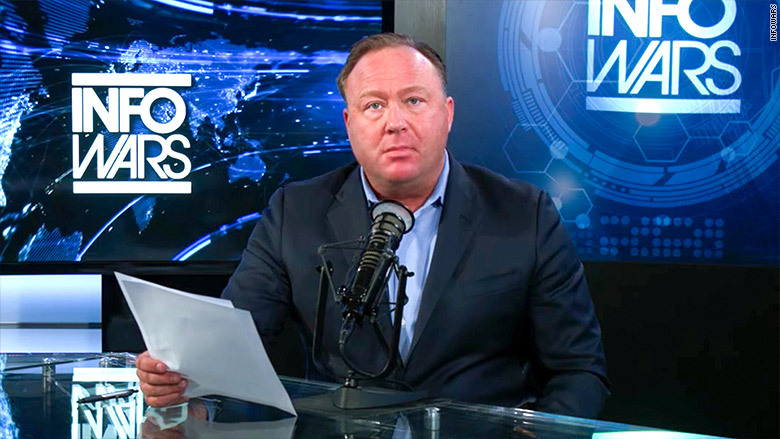 Alex Jones has been digitally "deplatformed." Weeks of scrutiny about Infowars' presence on social networking sites has resulted in a domino effect on Sunday night and Monday: The hate news site, full of conspiracy gobbledygook, was sanctioned by Apple, Facebook, YouTube and Spotify. CNN's Charles Riley wrote about the moves here. The recent scrutiny was prompted by a question posed to Facebook by CNN's Oliver Darcy. Back in early July, he asked: If the company is so committed to stamping out misinformation, as it claims, why is Infowars still able to publish on Facebook? Late Sunday, actually, Apple removed Jones' entire library of podcasts associated with InfoWars from iTunes and its podcast app. It LOOKS like this decision influenced the other companies. Early Monday, Facebook unpublished several pages associated with Jones and Infowars. YouTube removed the Alex Jones Channel for violating its community guidelines. And Spotify dropped Jones' podcasts. "FAANG" references Facebook, Apple, Amazon, Netflix, and Google. Two of the five took action against Infowars. Notably, the site's app is still available in Google's app store, and in Apple's store too, as Paul P. Murphy reported. The companies cited "hate speech"
Oliver Darcy writes: "It was striking that the tech giants cited violations of their hate speech policies, not Jones' penchant for disseminating false news and peddling conspiracy theories." Facebook even pointed this out in its statement: "While much of the discussion around InfoWars has been related to false news...none of the violations that spurred today's removals were related to this." Until now, Facebook kept Jones' pages up and furiously defended itself, citing free speech concerns. Mark Zuckerberg even went on Kara Swisher's Recode podcast and explained why Jones and Infowars were not being sanctioned. "It was their own mythology about being neutral, coupled with the opacity of their algorithms and moderation practices, that enabled people like Jones -- and more than a few Republican members of Congress -- to baselessly accuse" companies like Facebook "of secret censorship in the first place," Wired's Issie Lapowsky says. 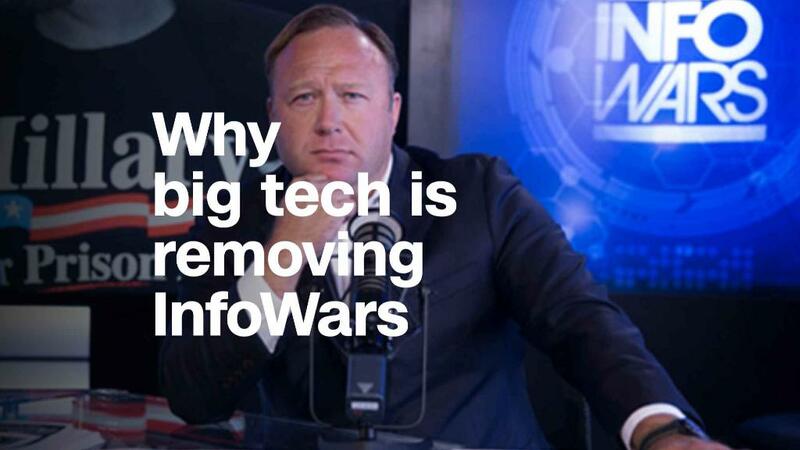 Her headline: "Why Big Tech's Fight Against Infowars Is Unwinnable." Whether that's true or not, this is a turning point. Emily Bell, the founding director of the Tow Center for Digital Journalism at Columbia's Graduate School of Journalism, tweeted on Monday: "What Facebook demonstrates via the somewhat inevitable Infowars decision, is that editorial decisions do not scale, they are culturally specific and liable to change over time. Put that in your algorithm..."
"Twitter remains Jones' only big portal to mainstream conversation," Darcy notes. "It was the only major social media company to take no action against Jones on Monday." A Twitter spokesperson told Darcy that neither Infowars nor any accounts associated with it are currently in violation of Twitter or Periscope's rules. Darcy writes: "Has the free speech can of worms been opened? Throughout the day, my Twitter mentions have been flooded with concerns about what big tech's action against Jones and Infowars means for free speech on the web, since private companies control so much of the conversation. Defenders of Jones, and those who are simply concerned, have employed a slippery slope argument to warn that other outlets could be next." The Drudge Report's banner on Monday night called the tech giants the "ANTI-SOCIALS." Drudge and other conservative media outlets have been hinting at doomsday scenarios, even suggesting that Monday's actions could ultimately lead to their removal. The move against Infowars "does lead to bigger questions, and it certainly will be interesting to see how it all plays out over the coming months and years," Darcy writes. "That said, I don't think we are going to be seeing big tech take action against Fox News or The Daily Caller any time soon." So, what is Jones saying? Remember when then-candidate Donald Trump went on Infowars and praised Alex Jones? "Your reputation is amazing," Trump said in December 2015. "I will not let you down." Shameful then, shameful now. On Monday, according to HuffPost, Jones begged Trump "to help him get back on the social media platforms," with "a monologue that alternately praised the president while claiming that the social media ban is part of a globalist conspiracy against him." Hey, time to reconsider Megyn Kelly's interview? Megyn Kelly was widely criticized by the media-chattering classes for interviewing Alex Jones. It happened almost exactly a year ago. But, looking back now, maybe Kelly was right to expose what Jones was doing and draw attention to the problem? Just thinking out loud here. -- Who ultimately made the decisions at these tech companies to take action? Did Tim Cook make the final call at Apple? Mark Zuckerberg at Facebook? -- Apple and Google took action against Infowars and Jones, but both companies have allowed the Infowars app to remain in the App Store and Google store. What's the distinction? -- Jones frequently streams content on Periscope, which is owned by Twitter. Is the company really confident that he hasn't violated any of their guidelines on the hours and hours of content uploaded? -- What happens to Infowars and Jones now that they've been dropped by these tech platforms? Will they drift off into the oblivion or still manage to stay in the conversation and survive as a company? -- Have any other media personalties violated the tech giants' usage policies as gratuitously as Jones has? -- What will the history books say about this moment in time?